I will make your wedding day beautiful. Weddings are my main focus so I keep up with trends as well as traditions, but the fun part is finding ways to help you meld the two to create your perfect wedding look. I’ve had the pleasure of working with hundreds of couples over the past 16 years. I take great joy in the creative process. I consider it an honor to be chosen to play a role in your wedding day. “My vision is that the true art of floral design is found through high quality flowers and superior design technique. Using natural and local materials in creative ways I incorporate flowers that represent the best of the season. With a degree in Plant and Soil Science from The University of Vermont and 23 years of professional design experience I offer a full spectrum of knowledge about flowers and plants. Dark chocolate. Or milk chocolate. Any kinda chocolate, really. In addition to creating beautiful weddings, I help florists rock the business-side of their business. 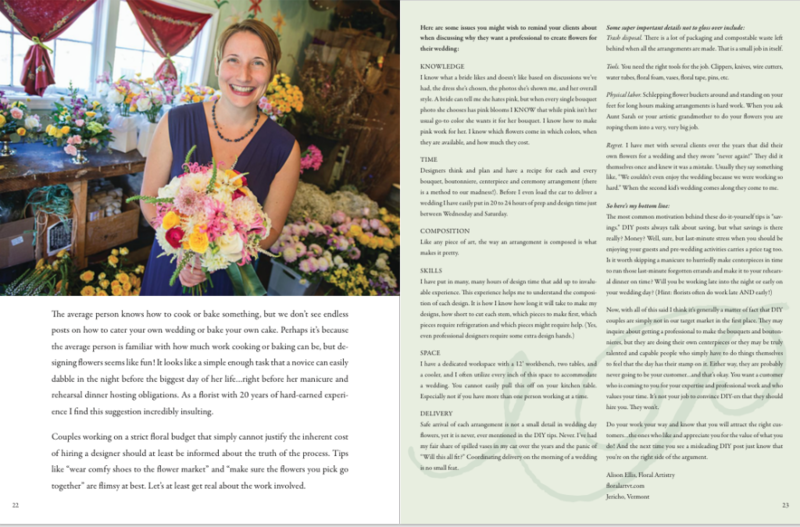 I’m a business contributor to Florists’ Review magazine & guest blogger for Botanical Brouhaha and Flirty Fleurs; 2 blogs that encourages & inspires floral designers. I moved to Vermont in 1996 to attend UVM where I graduated in 2000 with a Bachelor of Science in Plant & Soil Science and a minor in Small Business. While attending school I was a buyer and designer at a flower shop and after working for a few florists in the Burlington area, as well as an organic flower farm, it was time to branch out on my own. I’ve worked as a designer for 23 years and 2018 marks the 17th season for Floral Artistry. Pictured: John (age 6) making an arrangement after a wedding delivery. Find my Core Values HERE.